There’s no doubt about it: hair straightening cream can really make you feel like you have a different kind of hair. Your hair is shinier, smoother and the frizz goes away. If you have used it before, you already know that is takes some time until you get it right, though. The greatest thing about hair straightening cream for your permanent hair is that your hair is so much easier to style afterwards. You are able to do it faster, easier and you don’t need to use straightening irons. 0.1 Why use hair straightening cream? 0.2 What makes a good hair straightening cream for your perm? 0.3 How to get the best out of it? Why use hair straightening cream? Everybody is on the run these days and the less time you spend trying to control your frizzy hair, the better! It’s always a good thing when you don’t have to use your straightening iron as, no matter how many protective styling products you use before, your hair is still exposed. A hair straightening cream doesn’t only win you some time, but it also helps you get a look that is long lasting. the straightening cream gives you a hair style that lasts quite some time, no matter how rushed you may be. Last, but not least, the less you use the heat styling tools, the less you need to spend on the heat protective products also. most hair straightening creams also offer heat protection and they don’t just make your hair smoother and straighter, but also protect it when styling. 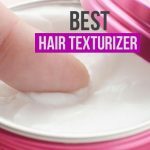 What makes a good hair straightening cream for your perm? You need to learn between the lines on the label of your hair straightening cream and see the essential info on that label. It’s very true that you can find hair straightening creams that don’t need heating afterwards, but most of them out there give the best results if you use a hair dryer and iron after the apply. So the hair straightening cream would need to be also heat protective. Best hair straightening creams are long lasting- and this means for more than just 24 hours! Stay away from those who can’t keep your hair straight for at least a day. No matter your choice, keep in mind that you need to call a friend if you do it at home. Even the best hair straightening cream can’t give you the ideal look if it’s not apply correctly! How to get the best out of it? First thing first, you need a hair dryer and a paddle brush to do it right. Don’t forget to condition your hair and to towel dry it first as straightening cream doesn’t go on a wet hair. Never forget the fact that hair straightening creams do come with some damage risk for your hair. you need to pay attention and always apply the hairline last. Even though they may all seem the same for you, actually they are not and hair straighteners don’t fit all the same. A visit to the hair salon would tell you about the density of your hair, texture, porosity, curl pattern and your overall health of hair. All this info is important before you use the hair straightening cream for the first time. Always read the instructions for after care. Some hair straightener creams may require you to not use heat tools for a couple of days and it’s wiser to do it so. No matter your final choosing though, keep in mind that hair is delicate and fragile and you should pay attention to all the details we’ve talked about. As it contains also natural essential oils, the L’Oréal Smooth Intense Xtreme Straight Crème helps you get a bit of control over your permanent hair. The oleo keratin straightening cream goes deep into your hair structure and makes your hair silky and frizz free. The hair straightening cream doesn’t last just one day and you can have three whole days without worrying for your hair getting out of style. The cream wears a nice smell and doesn’t leave your hair greasy. 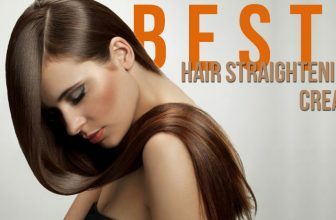 It also gives body to your hair that becomes softer, straighter and silkier. A little goes a long way and the hair straightening cream may do you good for quite some time. In order to get the best results, you should apply a small amount of the cream after you shampooed and conditioned your hair. you can blow-dry the hair afterwards. Seek that you apply the cream evenly and don’t rinse after you put it on your hair. All in all, for a good price, you get a hair cream that puts your perm hair under control and leaves it soft, silky and frizz free. If you feel you are up to the task, step up your game with the Matrix Opti Straight Japanese Hair Straightening Cream Resistant. You get the Matrix Opti straightening cream and the conditioning neutralizer as well and you really need to pay attention when applying it if you want the best results. The Matrix Straight Japanese Ionic Hair Straightening cream may be used by cold smoothing or combined with a straightening iron/blow dryer. Your hair gets straight, silky and smooth for a very long time and you don’t have to worry any time soon about your hair style as it’s always done. The hair straightening cream is a powerful cream that works on thick, course, colored, normal and even African American hair. the kit is designed for the multi Iconic technology and is gentle on your hair, if used right. Even though the cream may be used also as a cold smoothing system, but gives the best results with a flat iron and a blow dryer. Your hair gets tamed, frizz free and easier to control and to style. It becomes sleek, straight and full of shine. The Asian Tea fragrance from the cream minimizes the ammonia odor and gives your hair a nice smell just as well. 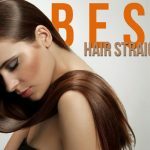 Even though your hair gets smooth, it maintains a good body and doesn’t seem flat. It’s better to wait a few days until you dye your hair after using the hair straightening cream. Despite the small issues, the cream is an efficient, powerful straightening cream that makes your hair straight and soft for a long time. When you are patient enough and ready to see the big save for your wallet, get yourself the Shiseido Professional Crystallizing Straight H1+H2 for Coarse or Resistant Hair. The Shiseido Crystallizing Straight involves a new technique that makes the frizzy, curly or wavy hair entirely straight, without damaging. The hair becomes shiny, soft for a long time and its health isn’t put at risk. The hair is shiny and with a nice body. The frizz is gone and the hair becomes easier to style and manage. The cream may be used also by the African American hair and the colored/highlighted hair. The instructions are easy to follow and your hair remains soft with a silky feel, but not flat. The cream doesn’t wear a specific smell and even if it’s efficient, doesn’t bring damages to your hair. All in all, as it makes your hair straight, shiny and soft for more than few days, the cream is a good option to consider. 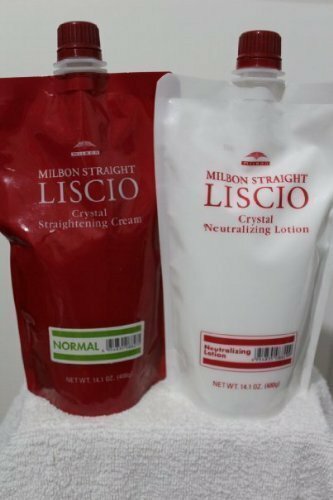 If you are truly dedicated to your hair and really know what you are doing, a reliable and efficient product to straighten your curls is the Liscio Crystal Cream Straighteners & Neutralizer. The new Japanese Retexturing is able to give your hair a new course, thick, curly hair a new texture. Your hair becomes silky, soft and smooth and the frizz is gone for quite some time. the results are permanent and you are good to go for up to 8 months when using the cream. The cream is formaldehyde-free and is created in the top professional salon brand Milbon from Japan. After applying the cream your hair is smoother, silkier and easier to blow styling. The cream works also for the fine hair and inconsistent waves. Even though your hair gets smoother, this doesn’t mean it can’t still have a good body and thick. The hair straightening cream is strong, but your hair doesn’t break nor gets damaged when using it. It actually grows back fuller and faster when using the cream. On top of everything, you only need one hour to apply the straightening cream. Other than this, we have no cons and we take the cream to be efficient and with permanent results. 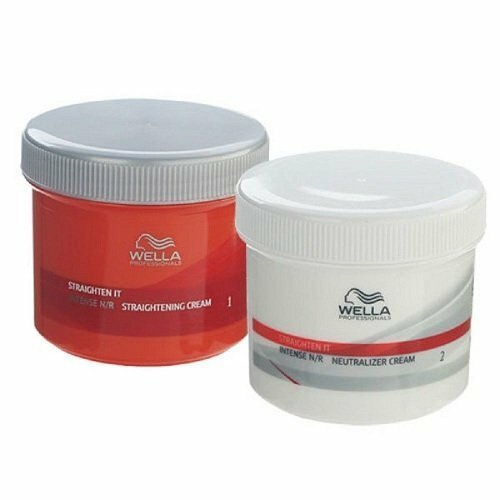 For the experienced and the trained hands, an efficient solution for straightening the hair is the Wella Strate Intense N/r Hair Straightener Straightening Cream Smooth Perm. The hair straightening cream works for both men and women and addresses to normal and resistant natural hair at the same time. The hair straightening cream makes the curly, course, frizzy or wavy hair relax and straighten. The hair gets softer, smoother, silkier and straight. It’s easy for you to style it afterwards and the effects are long lasting. Despite the fact the cream is rather powerful, your hair doesn’t get damaged and is less prone to breakage. The ends don’t split and the hair is just straight and smooth, with a good body. You need to use both the straightener and the neutralizer in order to get the best results. The effects are permanent as long as you also use hot hair iron and don’t rinse hair after apply. You should follow carefully the instructions and comb your hair after you put the cream on your hair. When it comes to the cons, we need to mention the strong smell of the straightening cream that is minimized by the nice smell of the neutralizer. All in all, the hair straightening cream is a great product that gives permanent results on your curly hair.